While you're visiting Niagara Falls, take a morning or afternoon tour of the spectacular attractions on the Canadian side of the Falls. 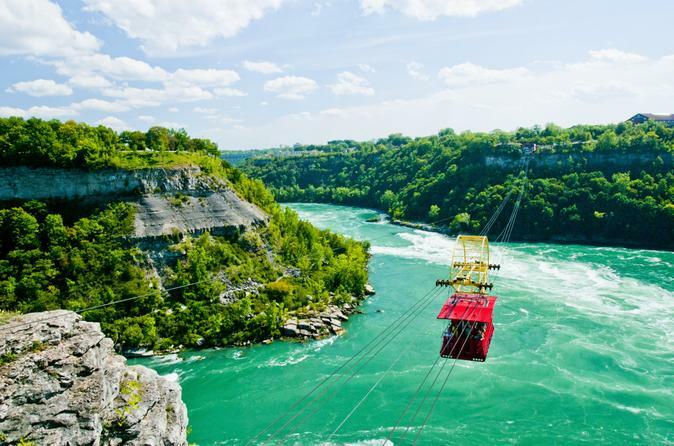 Highlights include an exhilarating ride aboard the famous Maid of the Mist boat at the base of the majestic Horseshoe Falls, and a trip up the Skylon Tower for a bird's-eye view of the Niagara region. See the Canadian side of Niagara Falls inside and out on this 5-hour group tour with a knowledgeable local guide who has all kinds of interesting information to share about this world-famous natural wonder. 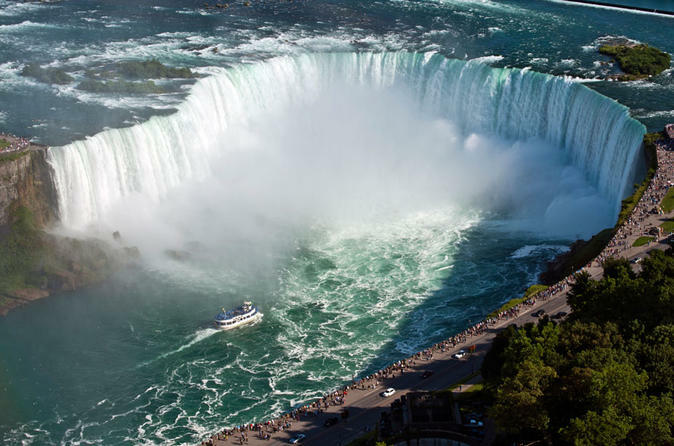 Experience the top attractions like Skylon Tower and Journey Behind the Falls, take an exciting Hornblower cruise or visit the Butterfly Conservatory and Niagara Fury depending on the season, and visit several viewpoints for various perspectives of the whole site — American Falls, Bridal Veil Falls and Horseshoe Falls. This tour is limited to just six people, ensuring you enjoy a small-group experience. You can stand on dry ground and look at Niagara Falls all you like, but to truly experience the majesty, a boat ride is a must. 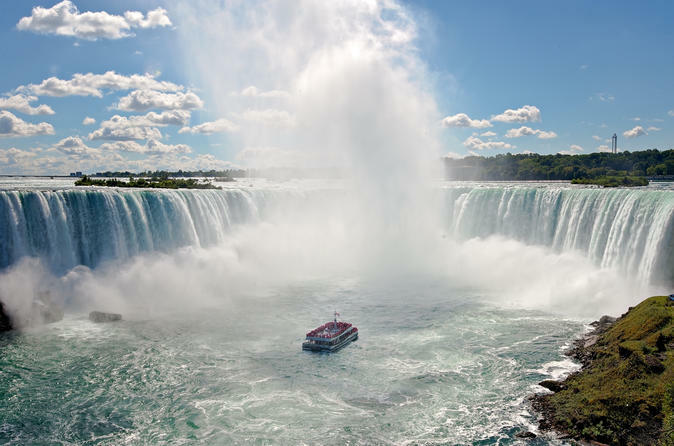 This 30-minute boat tour from the Canadian side of the falls takes you along the Niagara Gorge and past American Falls and Bridal Veil Falls before arriving at the main attraction, Horseshoe Falls. Stand on the deck of the boat to feel the mighty spray of water, or admire the views from behind the shelter of glass walls. Choose a morning or evening departure. With mobile tickets, simply scan your phone for direct entry onto the cruise. 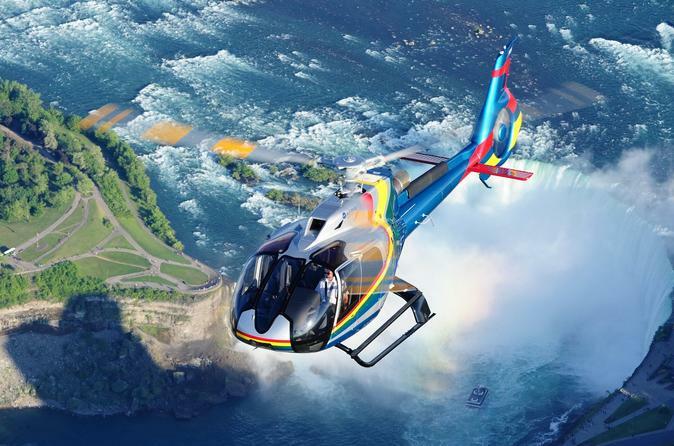 Marvel at Niagara Falls from a bird's-eye view on this exciting 20-minute helicopter tour. Enjoy unsurpassed panoramic views of Niagara Falls and Niagara-on-the-Lake's historic landmarks, and then fly over the region's renowned wine country. See it all in a way unimaginable from the ground! Experience Niagara Falls from top to bottom on this activity-filled tour of the Canadian side of the falls. 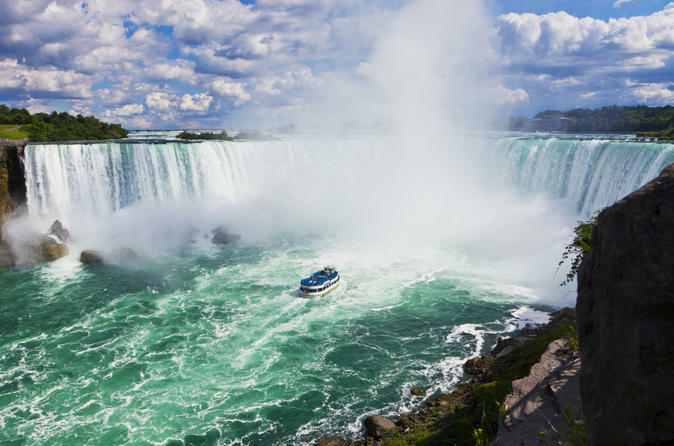 Be wowed on an exciting helicopter ride; feel the power of the water on the Journey Behind the Falls; get up close to the thundering stream on a Hornblower cruise; and visit several viewpoints for various perspectives of the whole site. 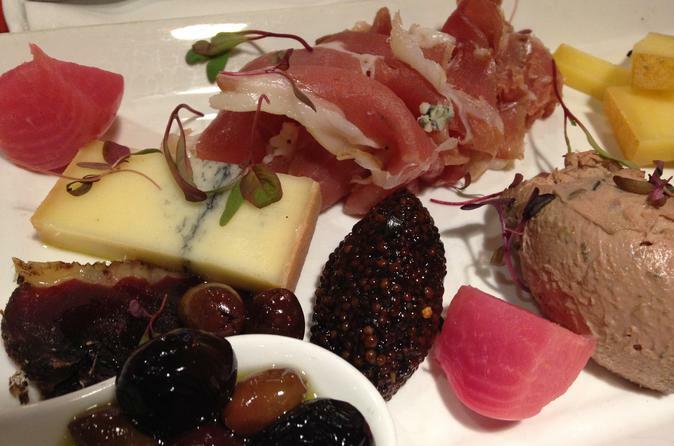 Plus, have lunch at the revolving dining room at Skylon Tower! This tour is limited to just seven people, ensuring you enjoy a small-group experience with a knowledgeable guide. 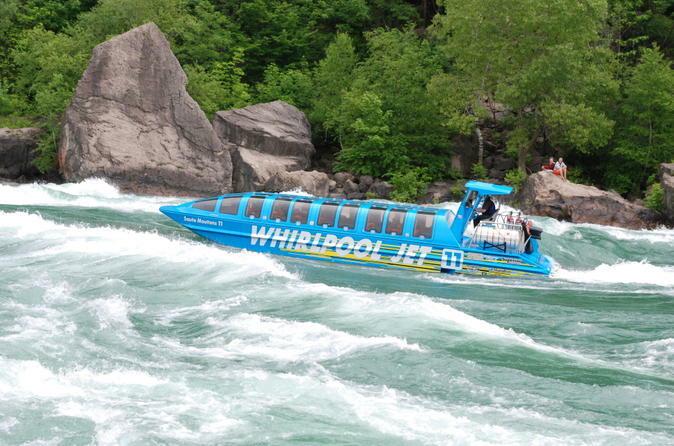 For a truly memorable visit to Niagara, take a thrilling journey down the Niagara River on an open-air jet boat. 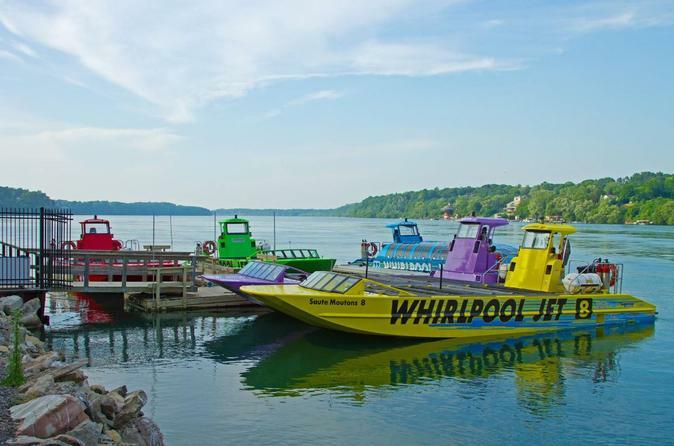 There's no better - or wetter - way to enjoy the beautiful scenery and amazing white water of the Niagara River. 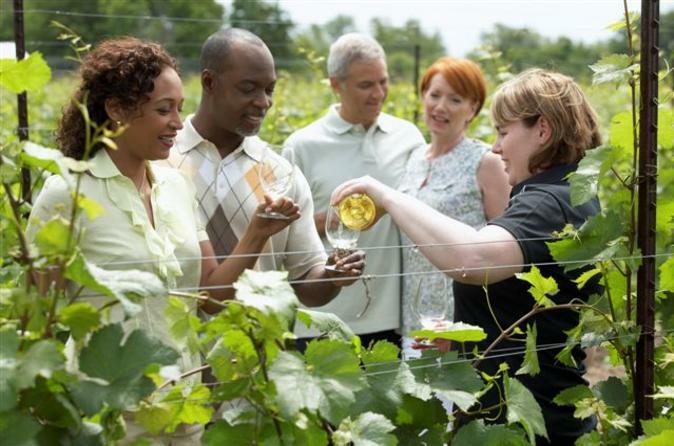 Discover Niagara-on-the-Lake’s gorgeous wine region, part of the greater Wine Country Ontario, and sample the area's variety of world-class wines on this morning or afternoon small-group tour! Visit both small- and large-production wineries, and sample delicious varietals, including Ontario's famous ice wine. It’s a flexible tour that will fit your schedule, with departures in both the morning and afternoon and hotel pickup in Niagara-on-the-Lake or Niagara Falls, Ontario. Limited to 15 passengers, this small-group tour provides an intimate experience with a professional guide. Experience Niagara Falls at night on this 40-minute boat tour through the Niagara Gorge. 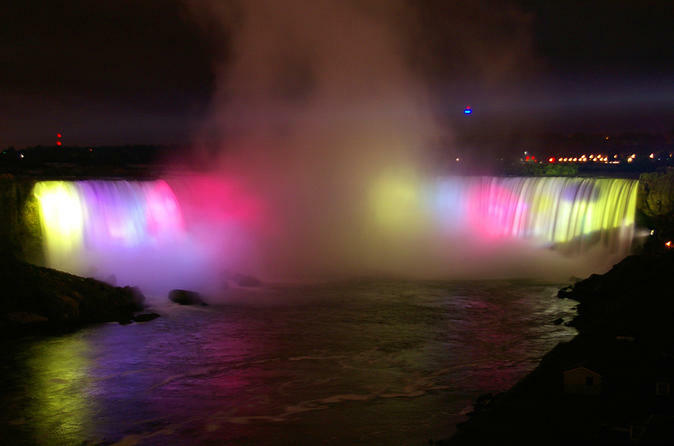 Admire dramatic views of American Falls, Bridal Veil Falls and Horseshoe Falls after dark, when they are lit with colorful illumination. And if you’re there on the right night, you’ll have an even more exciting experience as fireworks light up the sky and reflect on the water below. Snacks and drinks are available for purchase on board. 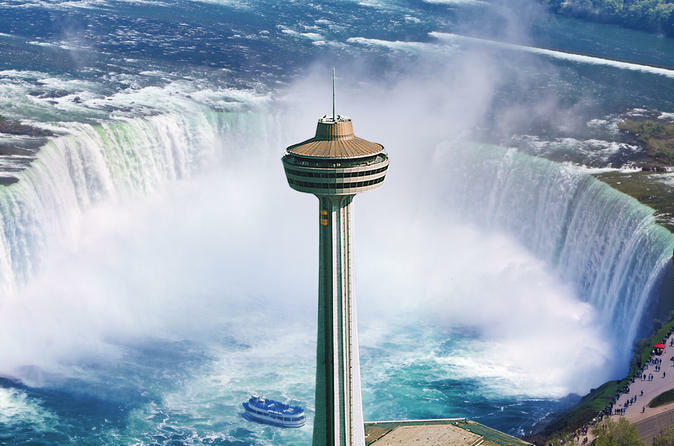 Visit Skylon Tower for the best views of Niagara Falls. This admission ticket provides access to 'Ride to the Top,' the glass-enclosed elevator that whisks you up to the indoor and outdoor observation deck, which stands 775 feet (236 meters) above the waterfalls. Be wowed by the 360-degree views, and go at night if you want to see the illuminated falls and seasonal fireworks display. If you want a bite to eat, two dining options are available, the Revolving Dining Room and the Summit Suite Buffet (food and drinks at your own expense). 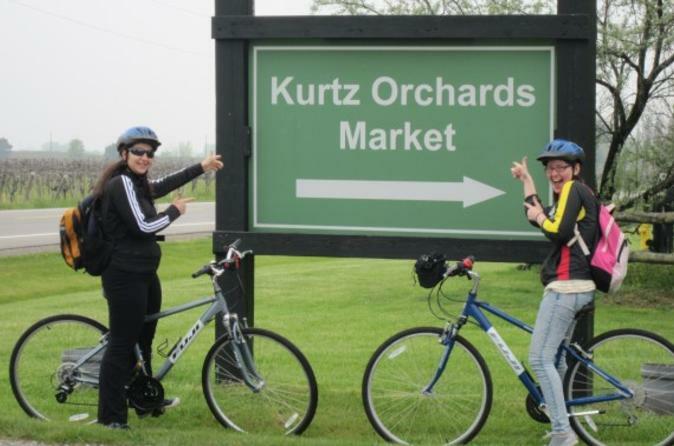 Enjoy beautiful scenery, great bike trails and Niagara-on-the-Lake's finest wines on this biking and wine-tasting tour. Niagara-on-the-Lake is an incredibly scenic town, located on the shores of Lake Ontario, and is ideal for exploring and wine tasting by bicycle! 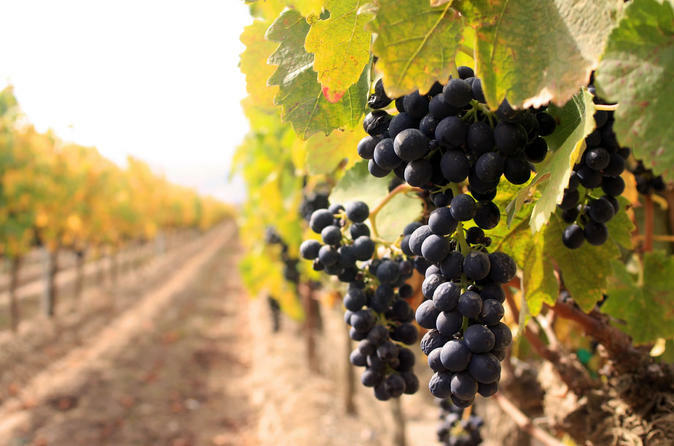 With relatively flat, easy biking routes connecting the wineries, this tour is suitable for all fitness levels, and any wine you purchase will be delivered to your hotel. Choose either the 6.5-hour tour that includes a delicious picnic lunch or the 4.5-hour tour that includes a specialty cheese pairing. 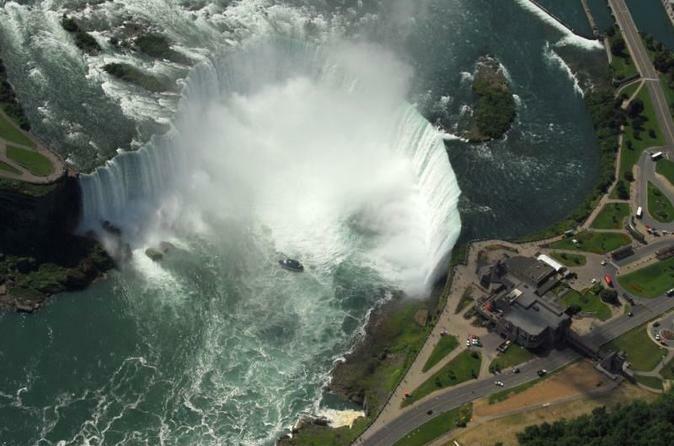 Marvel at Niagara Falls from above on an exciting 10-minute helicopter ride! 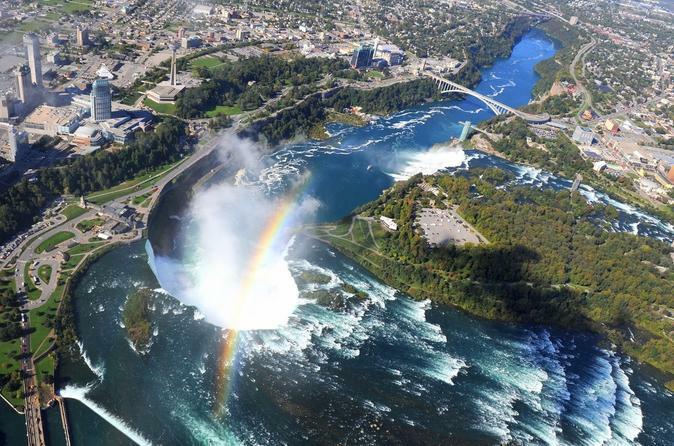 As you fly a scenic route along the Niagara River, see all of the area’s spectacular natural attractions, from Whirlpool Rapids to the three waterfalls that make up Niagara Falls — American Falls, Bridal Veil Falls and Horseshoe Falls. You’ll also zoom past sites like Skylon Tower and Rainbow Bridge. Individual headsets provide interesting and informative commentary about the falls as you fly. See and experience the best of Niagara Falls on this 4-hour sightseeing tour of Niagara's American side. 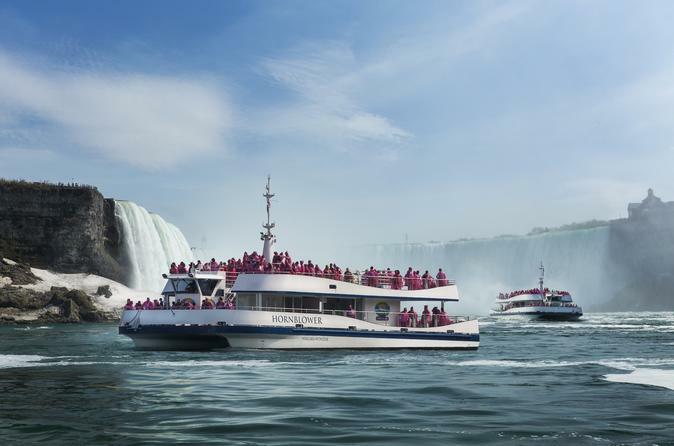 In addition to a fully narrated tour by coach, this tour also includes a ride on the famous Maid of the Mist gorge cruise and admission into the Prospect Point Observation Tower for spectacular views of the falls. Visit Niagara Falls State Park, Bridal Veil Falls, Three Sister Islands, Whirlpool State Park and more! 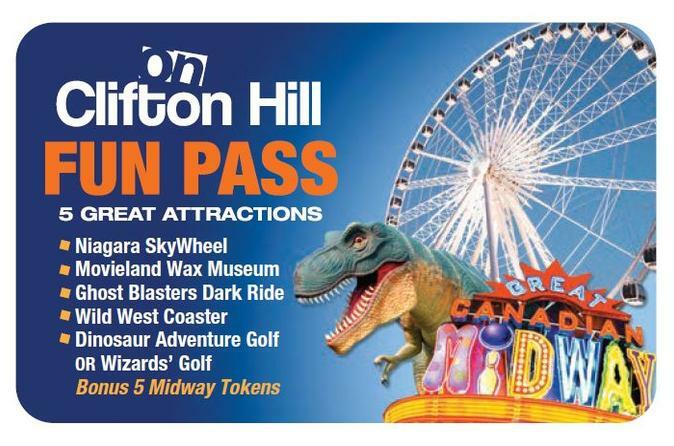 Make the most of your Niagara Falls visit with this wallet-friendly Fun Pass that gets you into five attractions on Clifton Hill. The entertainment promenade is home to the Niagara SkyWheel, Canada's largest observation wheel. Take a spin on it before or after an 18-hole round of golf at Wizards Golf, a glow-in-the-dark minigolf course; photo ops next to famous folks at the Movieland Wax Museum of Stars; a rollicking ride in an XD theater; and a haunted house with laser guns. 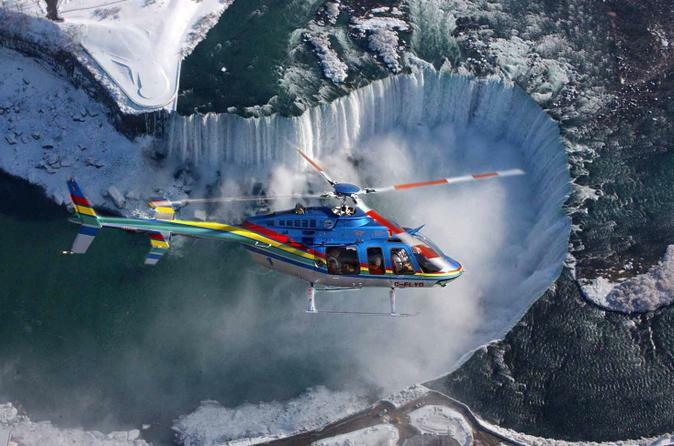 Enjoy an unforgettable experience with your loved one on this romantic Niagara Falls helicopter tour. Sip sparkling wine and take in the sights of the majestic falls, historical landmarks and Niagara's renowned wine country on a private 20-minute or 25-minute helicopter flight. Love is in the air! Capture bird’s-eye views of Niagara Falls aboard the Niagara SkyWheel, Canada’s largest observation wheel. 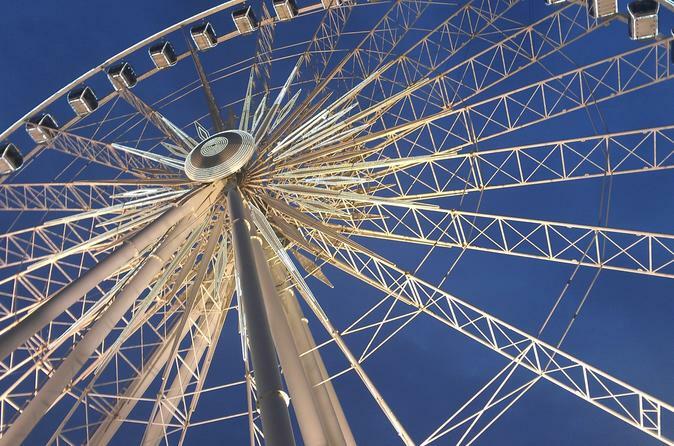 The 175-foot-high (53-meter) giant Ferris wheel offers showstopping views of Niagara River, Niagara Parks and Clifton Hill. Inside a climate-controlled gondola, you can snap photos of the sights as a recording explains what you see during the 8- to 12-minute ride. This budget-friendly Niagara Falls attraction is available year-round, day and night, rain or shine. All the thrills of a jet boat ride without getting wet! 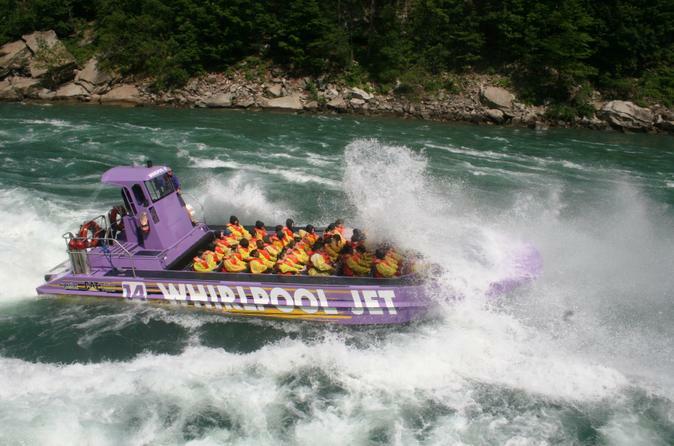 The Niagara Gorge Domed Jet Boat Ride speeds down the Niagara River and past 18 miles (29 km) of exhilarating scenery to the churning white waters of the famous Niagara Whirlpool. 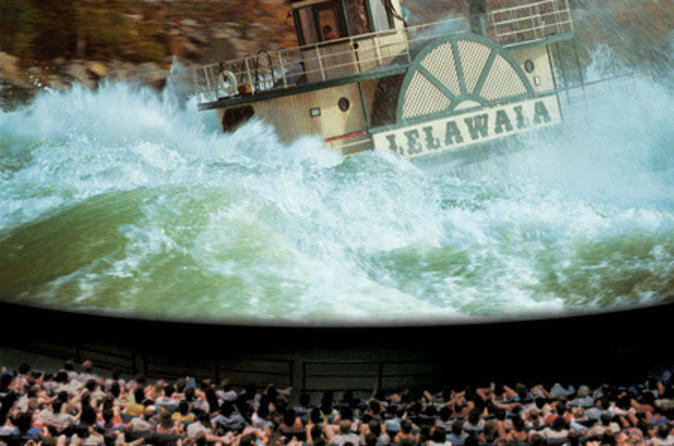 The covered boat keeps you dry as waves crash and splash around the domed jet boat! Enjoy the original all-Canadian musical experience featuring over 60 songs by award-winning Canadian artists. At Oh Canada Eh? the performance and food service is rolled into one. 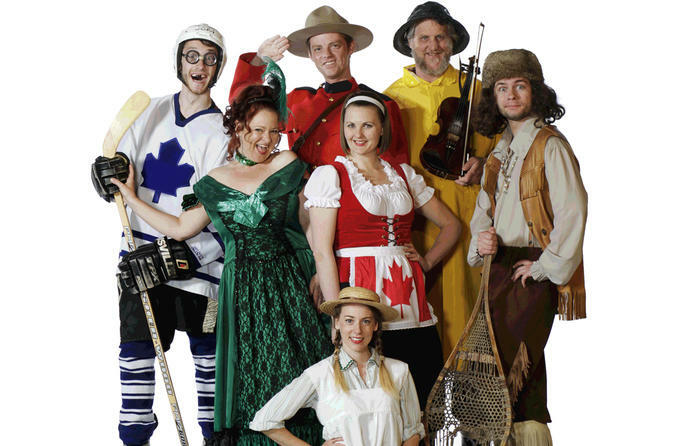 Meet singing Mounties, Lumberjacks, Anne of Green Gables and even a hockey player as they serve a delicious family-style dinner during this entertaining theater show, rated No. 1 on TripAdvisor! There is no better way to enjoy Niagara Falls at night than aboard a 700-passenger catamaran cruise. 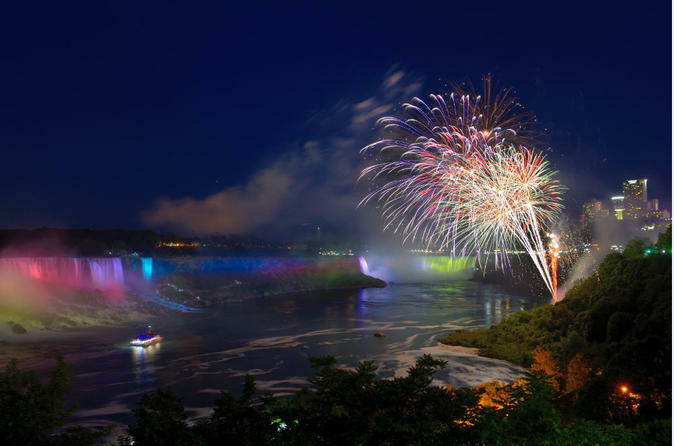 Join us for the thrill and spectacle of the Falls Fireworks aboard this intimate Falls Fireworks Cruise. This extraordinary 40-minute evening cruise is set against the backdrop of dazzling city lights and the colored illumination of the Falls complete with a spectacular fireworks display overhead (weather permitting). Evening cruises are complete with on-board fully licensed bar, light snacks and music. Embrace your inner foodie on this 3-hour culinary walking tour of beautiful Niagara-on-the-Lake. 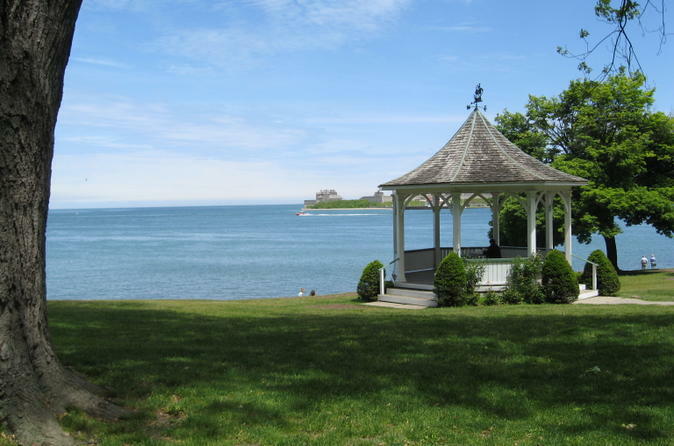 Your knowledgeable guide will introduce you to locals and teach you about the history of this scenic town, where the Niagara River blends into Lake Ontario. Taste your way through the best dishes in town and walk them off exploring the nooks and crannies of this historic hamlet. Tours are limited to 12 people to ensure a quality experience. 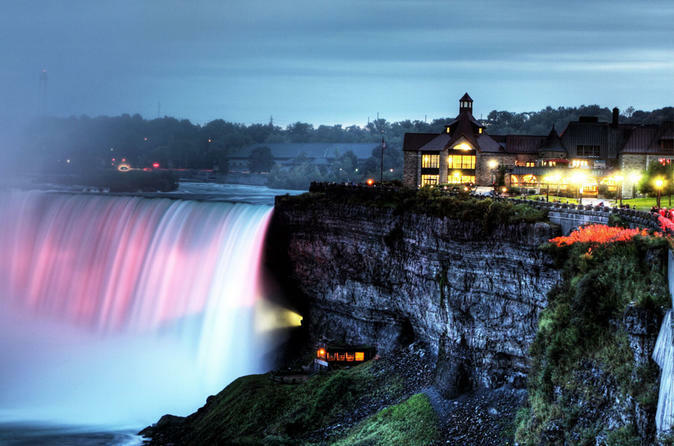 Visit the Canadian side of Niagara Falls on this all-inclusive day and night tour. 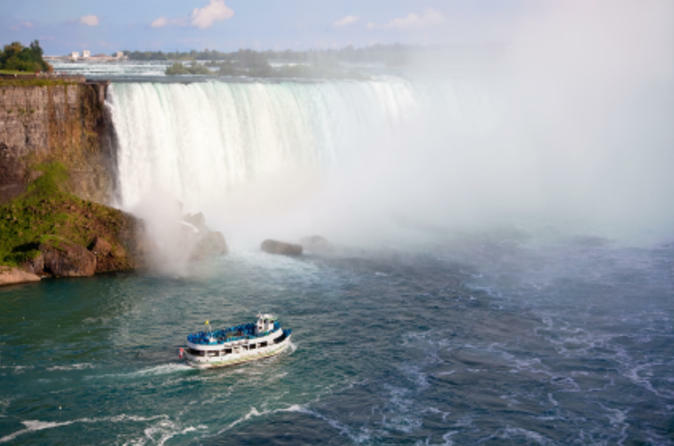 Experience Niagara's top attraction during the day, with popular stops including Skylon Tower, Journey Behind the Falls, and the Hornblower Cruise. Then enjoy the illuminated natural wonder at night time on the Illumination/Fireworks Night Cruise. 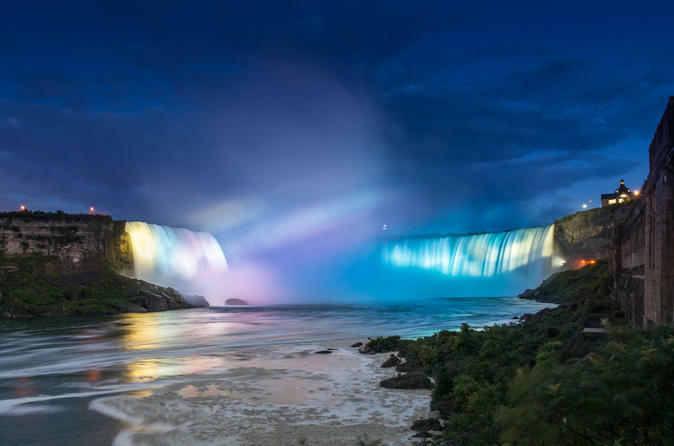 Watch as the lights on Niagara Falls change in real-time. The night tour includes an exclusive visit to the Illumination Tower and a 3-course dinner at the Elements on the Falls Restaurant. Discover the thundering falls from a totally new and awesome perspective, and plunge over them along with history’s daredevils with the Niagara Falls IMAX Movie. See it on a 60ft (18 m) screen with 12,000 watts of digital surround sound. Enjoy a private tour and tasting at Niagara’s only lakefront vineyard and winery, Konzelmann Estate Winery. Sample four local Ontario wines during a wine-tasting seminar, and tour the winery to learn about winemaking. For a truly unique experience for anyone visiting Niagara Falls, stop by Bird Kingdom to get up close to your favorite birds, reptiles, fish and other amazing animals. 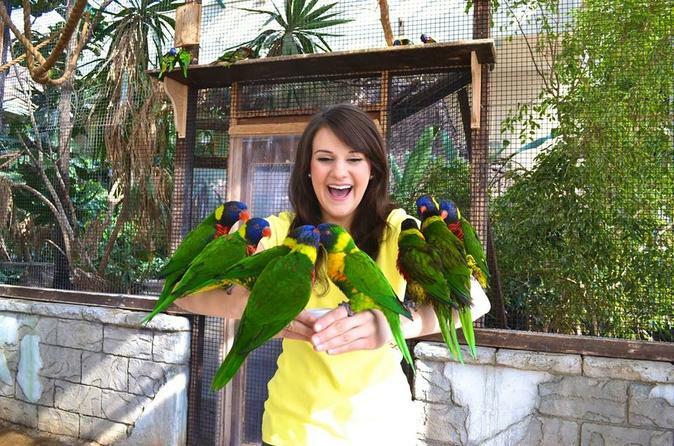 Enter the world's largest indoor free-flying aviary, which houses a diverse collection of more than 500 exotic birds representing nearly 80 species from around the world, and encounter other cool creatures such as snakes, bats, spiders and lizards. Bird Kingdom is perfect for families and people of all ages. Experience the sights and tastes of Niagara Falls and Niagara-on-the-Lake by combining a helicopter tour and wine-tasting tour. Soak up incredible aerial views of Niagara Falls on an exciting 20-minute helicopter flight, and then land at an award-winning winery in Niagara-on-the-Lake for a guided tour, wine-tasting session and even lunch if you wish. This combo tour gives you a marvelous experience of this scenic region that straddles New York and Ontario. See the best of the Niagara Region by land, water, and air on this action-packed tour. Marvel at one of the world's most stunning wonders, Niagara Falls, from a turbocharged jet boat as it races up the Niagara River rapids. 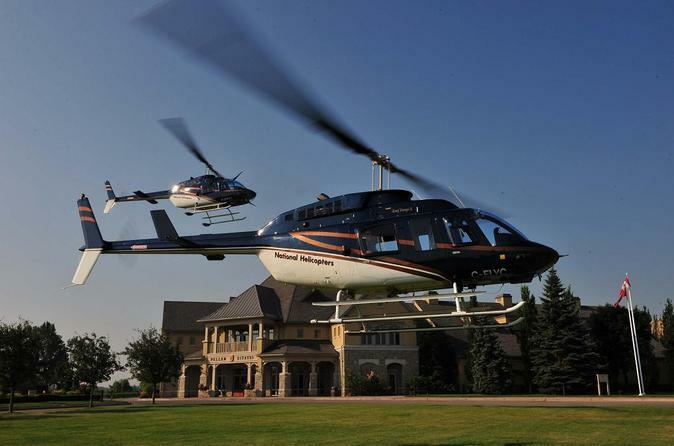 Then hop aboard a helicopter for an aerial view of the entire Niagara Region. Along the way you'll learn about the area's history and how the falls were formed. Wrap up the day getting to know the gentler side of Niagara at a small family winery, where you get to sip wine and gaze at vineyards. On top of Clifton Hill lies a skyscraper fallen on its side — Ripley’s Believe It or Not! museum. Book entry to one of Ripley’s attractions, or enjoy discounted access to two or all three of Ripley’s attractions: the Odditorium, the wax museum and the 4D moving theater. Discover unusual artifacts like two-headed animals and shrunken heads, find icons like Madonna and Monica Lewinsky standing side-by-side, and experience a movie ride that’s not for the fainthearted. Surprises are in store for young and old alike! 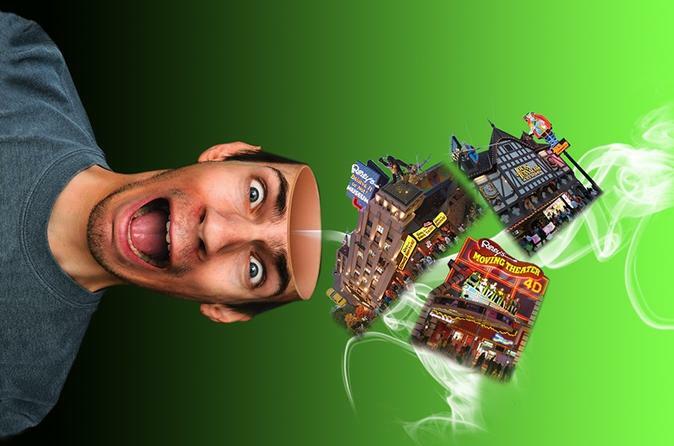 Please note: Ripley's Believe It or Not Museum will be undergoing a complete renovation effective November 2, 2015. Museum to reopen in 2016. Experience Niagara beyond the waterfalls and eat your way through some of Ontario’s best Italian-Canadian food with an informative guide on this small-group walking tour. You’ll sample gourmet pizza, savory meatballs and smooth, creamy gelato throughout the day. 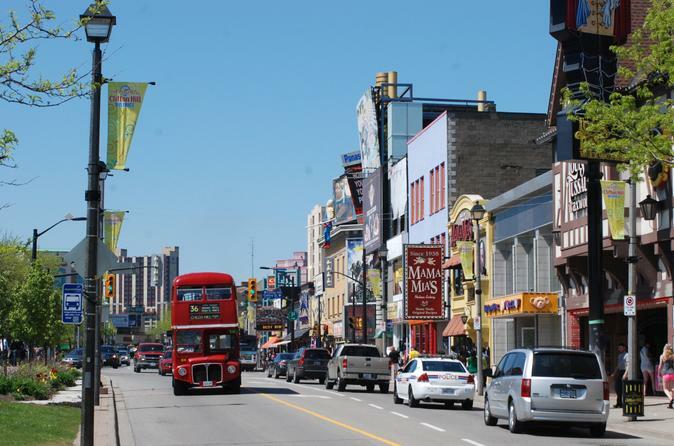 Walk it off on scenic trails and streets to other points of interest, including Niagara Falls, Niagara’s parks and quirky Clifton Hill. Join your experienced local guide for a 1.5-hour, fun and informative walking tour of Canada's prettiest town - Niagara-on-the-Lake. It’s the best way to connect to and feel the heartbeat of our town! Explore the sites that echo with stories of the past, heroes and villains, revolution and war, slavery and freedom, arts architecture and culture. Discover the secrets of how this little town has adapted to changing times and changing fortunes. Did you know the main street, full of pretty shops and restaurants today and rich with the history of a provincial capital, was once the site of a "biker bar" and a gas station? Your local guides’ enthusiasm and knowledge will combine to inform and captivate you each step along the way. A ninety minute walking tour, visiting more than 20 sites. 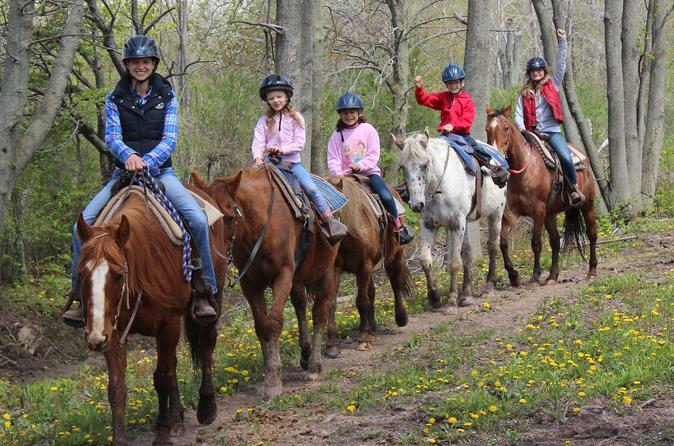 Explore the great outdoors near Niagara Falls on a horseback ride to the shores of Lake Erie! Gorgeous countryside, gentle horses and experienced guides make this the perfect way to experience the peaceful beauty of Ontario. Designed for beginners and experienced riders alike, this trail ride can be enjoyed by everyone! Explore Niagara Falls with a private guide who is at your service to provide interesting commentary about this spectacular natural wonder. This private tour includes round-trip transport from anywhere in Niagara Falls and gives you the flexibility to see the best of the falls in the time frame you prefer. Choose from three tour durations to fit your activities, and customize your experience with the help of your guide. Stroll various walkways that get you closer to the action or select optional attractions like Skylon Tower, the Journey Behind the Falls or even an exciting helicopter ride. Experience Niagara Falls by night on this 4-hour tour. Start with a 3-course dinner at a restaurant located a stone’s throw from Horseshoe Falls, and look out from a wall of windows as the mighty cascade lights up in dramatic hues. Don’t like the color? Visit the tower where the spotlights are mounted, and change the shade. Then, approach the thundering falls as close as possible during a Hornblower cruise. From May to October, wrap up the night with a stunning fireworks show. Enjoy a fully guided 9-hour tour with exceptional customer service, the most entertaining tour guides, and the safest drivers. Learn about the region as you experience the best Niagara has to offer with behind the scenes access and no lineups. Experience a private tasting at an award winning Niagara Winery, indulge yourself in the charming town of Niagara-on-the-Lake, and ride aboard Niagara's world famous Hornblower Cruise. 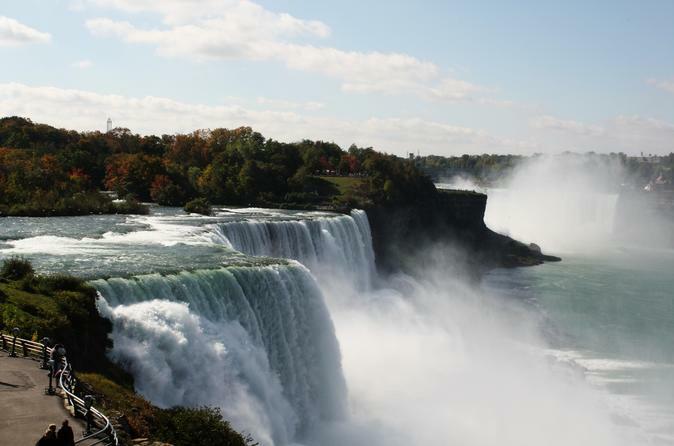 Other stops along this tour include Floral Clock, Niagara Falls Hydro Power Station, and Niagara Gorge and Whirlpool Rapids. 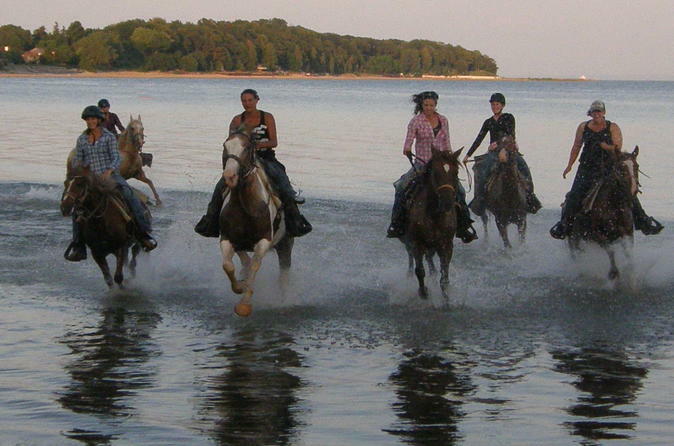 Explore the beaches of the beautiful Niagara Region on a horseback riding tour. Your guide will accompany you on an easy ride along the trails near Lake Erie and around the Wainfleet Wetlands Conservation Area, located only 45 minutes from the Niagara Falls. Bring your camera as you treat yourself to gorgeous views. The standard tour is perfect for groups. For a more intimate and romantic evening, book the private tour for two. This 3-hour tour winds through the city of Niagara Falls, through wine country en-route to St. Catharine's. Listen to the stories and see the sites that made up the African-Canadian experience. Uncover what was the second leg of the Underground Railroad, visit Harriet Tubman’s first freedom home and place of worship, the BME Church in St. Catharine’s, Ontario. Your tour includes a visit to the cemetery for former slaves, and various freedom crossing points. 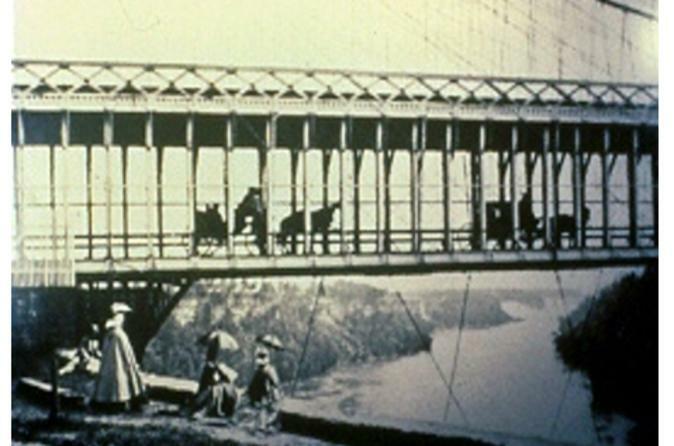 Also catch the panoramic view of the Falls and the same view that Tubman had as she crossed over in Canada. 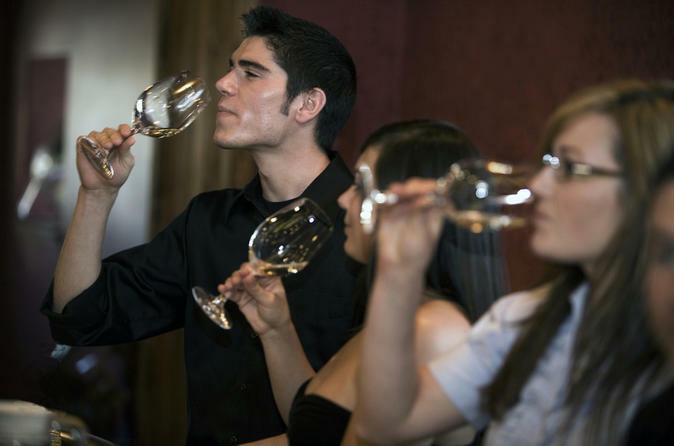 Join a fun filled 6-hour guided wine tour of Niagara's Wine Belt, Niagara-on-the-Lake. 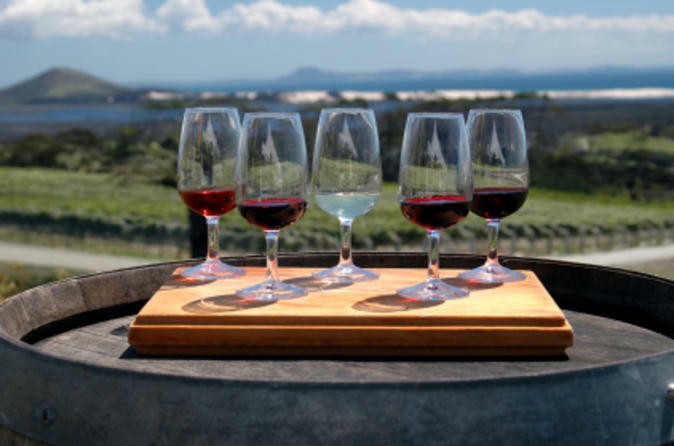 Savour and sip free wine samples from four local award winning wineries and enjoy a complimentary guided winery tour at one of the wineries. Don't forget the bonus stop at the local chocolate factory. Tours also make a stop for lunch at a local restaurant or country market (additional fee). Each tour offers four conveniently located pick-up spots throughout Niagara Falls Canada starting at 9:30am. Sip, savor and stroll through Niagara vineyards on this 3.5-hour tour. 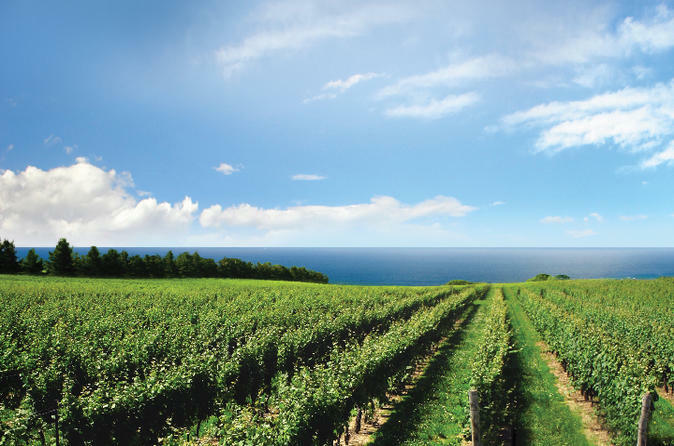 Explore Niagara-on-the-Lake's pioneering vineyards. Taste Ontario VQA wines in barrel cellars and private tasting rooms, and sample award winning white, red, sparkling and ice wine in a small group. Enjoy the original all-Canadian musical experience featuring over 60 songs by award-winning Canadian artists. Meet singing Mounties, Lumberjacks, Anne of Green Gables and even a hockey player during this entertaining theater show, eh! Rated No. 1 Theatre in Niagara Falls on TripAdvisor! 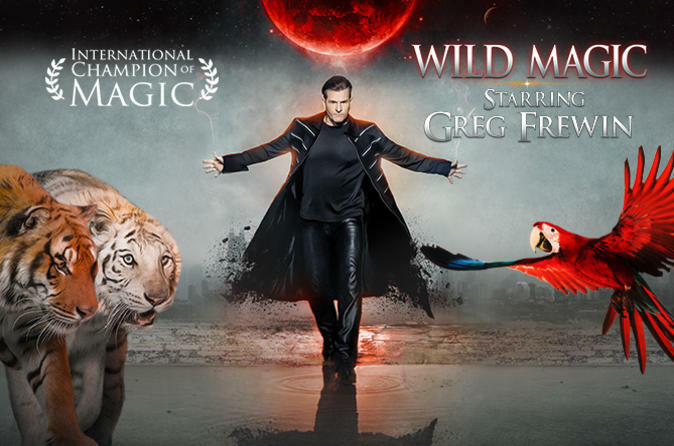 This night of entertainment includes the show only; dinner is not included.